Chairman of the Corporation Paul E. Gray '54 announced earlier this month that he will step down next June after seven years in office. Gray, who has served as a professor of engineering at MIT since 1957 and president from 1980 to 1990, is not planning to retire completely. At the age of 64, Gray plans to continue teaching and undergraduate advising "for at least a few more years," he said. As president and chairman of the Corporation -- as MIT's board of trustees is known -- Gray was known both as a committed educator and a deft budget handler and fundraiser, colleagues said. Gray "did a great deal to build the diversity of the student body, faculty, and staff, and had a great personal commitment to doing so," said his successor as president, current President Charles M. Vest. Before becoming president, Gray spent nine years as chancellor, a special deputy position created for him by then-president Jerome B. Weisner. Overall, except for two years in the army, Gray has been at MIT since he was a freshman 1950. A search committee co-chaired by Massachusetts General Hospital Surgeon in Chief W. Gerald Austen '51 and Harvard Medical School Professor of Surgery Edward D. Churchill hopes to present the 78-member Corporation with a new chairman by next year. "The search committee is looking broadly both inside and outside the Institute for candidates," Vest said. He cited experience in complex organizations and a good understanding of academia as among the general qualifications. Vest did not say whether or not he considered himself a possible candidate. As Gray announced his decision to shift his focus back to teaching, he criticized the notion that universities promise research professors that they will not have to teach. He called it an "outrageous scandal," but noted that there is a "long list of offenders." At the same time, colleagues praised Gray for his commitment to teaching both undergraduates and graduates. "I think his love of undergraduate education showed through during his many roles in the MIT administration," said Provost Joel Moses PhD '67, who was dean of the School of Engineering for most of Gray's tenure as chairman. "I recall that while he was president he co-taught a section of 6.002 during the year that EECS had 380 sophomores, and received a perfect 7.0 rating" in the Course Evaluation Guide, Moses said. Vest noted Gray's work with then-Dean for Undergraduate Education Margaret L. MacVicar to start the Undergraduate Research Opportunities Program. "He has throughout his career at MIT been a champion of undergraduate education," Vest said. "I feel fortunate to have served with him and will continue to rely on his good counsel." Colleagues have also pointed to what Moses called Gray's "tremendous memory for details." "It is said that no one ever understood the MIT budget as well as Paul Gray," Moses said. 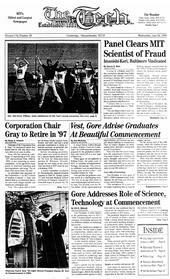 In 1992, Gray spearheaded MIT's record-setting $710 million fundraising campaign. Gray announced his decision to step down at the Corporation's quarterly meeting on June 7. Also at the meeting, the Corporation elected four life members -- Alexander W. Dreyfoos Jr. '54, head of Dreyfoos Group; Christian J. Matthew '43, founder of the humanitarian St. Mary's Foundation; Morris Tannenbaum, former vice chairman of AT&T; and William J. Weisz '48, former CEOof Motorola, Inc. -- and 13 term members.